#1. The Launch, and a maiden voyage to remember. – Sampson Boat Co. 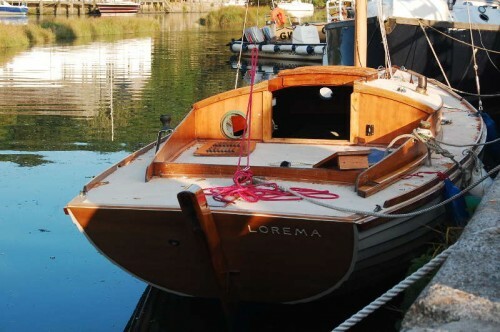 I launched Lorema at the beginning of July, 2013. 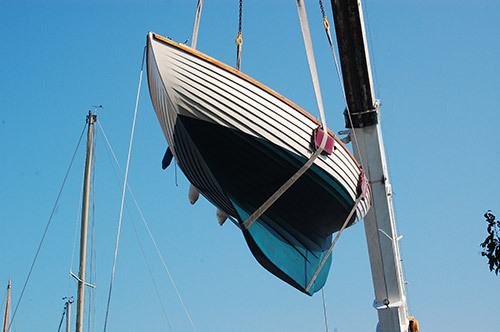 What I thought was going to be a few months in Gweek had turned into nearly a year, but as we shifted my tent and the crane lifted her out of the pond of offcuts, tools, and random bits of my life that had gathered around her, I saw the outcome – a boat that I really did know and love. There was still plenty of work to do before I could leave, but the launch was the moment that I knew I actually would leave. A couple of weeks on and I was ready to depart the Quay. With wind blowing straight up the creek, I sculled out from my berth, using the sculling oar that I had made from an wooden dinghy mast. As I left, a friend took an amusing video from the quay of another boat running aground whilst trying to overtake me. I was so involved in my sculling that I didn’t even notice at the time! I had been deliberating for a few months whether I was going to reattach the outboard brackets that had come off the boat, but in the end had decided to do without an engine at all for a few reasons; stowage space, the experience of having an outboard bouncing around off the stern in a choppy swell, and the challenge of cruising under sail and oar alone, not to mention my own farfetched romantic and aesthetic personal values! At this stage, however, I had only had a brief sculling lesson from a friend in the yard, and having sweated my way round the first couple of bends into bit of a breeze, I gladly accepted a tow from a workboat going downriver! I spent the night anchored off Tremaine Quay with some friends I had arranged to meet there, drinking tea and wondering if I had actually started this trip or if I was suffering one of those dreams which cause so much frustration to wake up from. Lo and behold, I woke up in the same spot, and left at 6am in convoy with my friends. 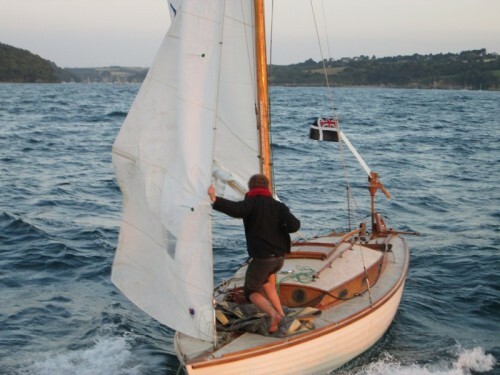 Their 45′ ketch soon left me behind though, and I was really alone, tacking into an easterly f5/6 to get around the Manacles (nasty cornish rocks!). 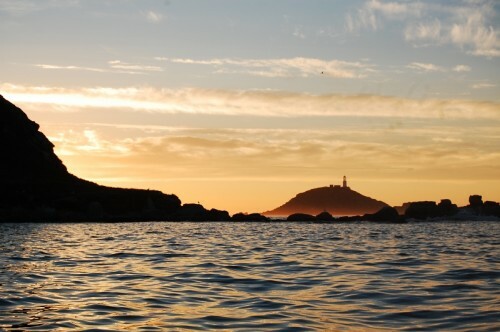 We had arranged to meet in the Scillies that evening, so I rounded the Manacles Cardinal and headed south on a beam reach to clear the Lizard, buzzing with excitement and fear. There was a fairly short and large swell, but Lorema took it in her stride, careening through her own spray at what seemed like a ridiculous pace for such a small boat. Round the lizard and then a dead run for the next 40 or so miles to the scillies. My self steering gear was holding her on course so well that I could keep the sails goosewinged, and I was enjoying the ride. About halfway there the wind increased to f7 and the swell was building, so I hove-to, to put the second reef in. As she bounced with the swells, the blade of my self steering gear dislodged (in my rush to leave I had neglected to put the split pins back) and went over board. 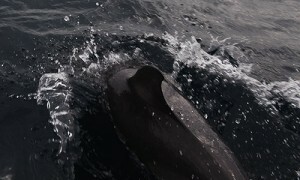 I sailed around to pick it up, but couldn’t get a grip on it with the boat hook, and by the time I had tacked for a second pass, I had lost sight of the small dark object in the swell. A good lesson from mother nature about proper preparation, but thankfully no real harm done. 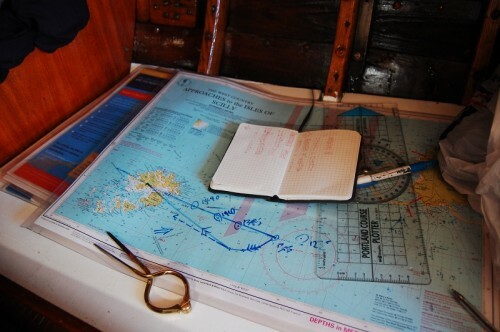 The rest of the way I helmed by hand, hoving-to every time I needed to navigate or get the biscuits. The wind was gusting 8 and the wave height was increasing. As she slammed into swells, thoughts of other possible forgotten jobs whirred through my brain, but there was nothing I could do except trust the work I had done and helm as best as I could. A couple of waves came over the stern, and I was glad that in the face of considerable scepticism, I had opted to cover over my cockpit with an aft deck. The water sloshed harmlessly off, and securely clipped in, I felt safe and stable even with a higher perch. I came into the Scilles on a bearing and sailed to St.Helens pool, where I anchored near my friends. The trip had been fairly hectic, but even though the weather had been worse than forecast, and I had lost part of my self steering gear, Lorema had performed amazingly well. They say that sailing close hauled is the most exhausting point of sail for a crew, but that a dead run is the hardest on the boat, so I was pleased that nothing had broken. It had been a serious sea trial, and a maiden voyage to remember! Your boat reminds me of my dream to own a sail boat. It almost happened in my late 20’s in 1973. I found a 24′ Dickerson Sloop in a place called Oriental, NC. I was second in line to buy and the man came on the last day at the last hour and took it away. The owner was very sad as he wanted me to have his boat. I found the man years later in 1997 who owned it and got in touch with him. He told me where the boat was… he had hauled it out in the woods, stripped it of anything of value and left the shell to rot and the engine to rust. I tried to buy the Clock and Compass but he would not agree. I never found another boat until years later when I had no job and no money to buy a rowboat…. I found information on the Tahiti Ketch and bought the Mechanic’s Illistrated Artical, I also bought plans for building a wooden Tahiti and also a Steel Tahiti and the Book that explained how to build both. This became my new dream to build and sail a Tahiti Ketch. My life was comical as I had this beautiful dream again for the second time when I had no money for tools or wood or steel or a shop to build my boat in. I resigned myself to admiring this boat. I even talked to Fern Nimphius – A Boat Builder in Wisconsin who I visited and shared my tools with. We discussed the Tahiti and how to build and what materials would be best, but I never succeeded in building this boat. I have watched the first 34 episodes and await the rest. I admire your determination and abilities to succeed in bring your dream into reality. Thanks, for the memories, for reminding me how beautiful a sail boat can be and how even dreams unrealized can remind the heart of the joy in life. Richardson Maritime Museum Executive Director Jane Devlin and Maryland Senator “Addie” Eckardt welcomed the hungry Dickerson sailors at the Museum breakfast and discussed the importance of keeping boat building craftsmanship alive on Maryland’s Eastern Shore and the expansion of the Museum and its Ruark Boat Building Center. your web site just destroyed my entire story about a dream………. 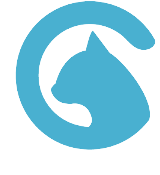 I will have to go to Word and try to write it again so it wont be destroyed before I can post it…. Good start although not without a couple of disappointments…. Very impressed so fat.